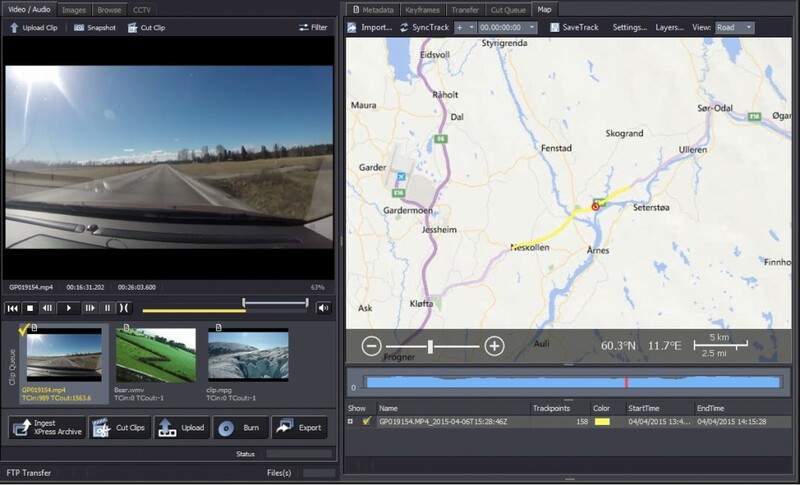 The new version of ViArchive XPRESS includes a map module which allows users to sync GPS data along the timeline of video clips. A clip which was recorded from a moving vehicle/drone for example, can be accompanied by the route the vehicle/drone was driving or flying. Current location in the map is also shown as you play the clip. The map module in ViArchive XPRESS allows users to sync videos with GPS data along the timeline. In order to show GPS location on the timeline of a video clip, you need to record a GPS track. This is often done by an own device (GPS track recorder), but is now also available as a service/app on a range of mobile devices. 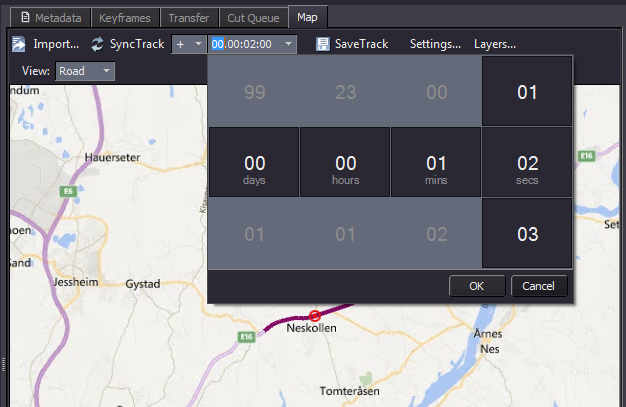 ViArchive XPRESS currently supports GPS tracks in the format GPX. The GPX file contains GPS points recorded in a sequence with time stamp. It can also contain data on altitude, positioning, speed and more. You can read more about GPX files here. 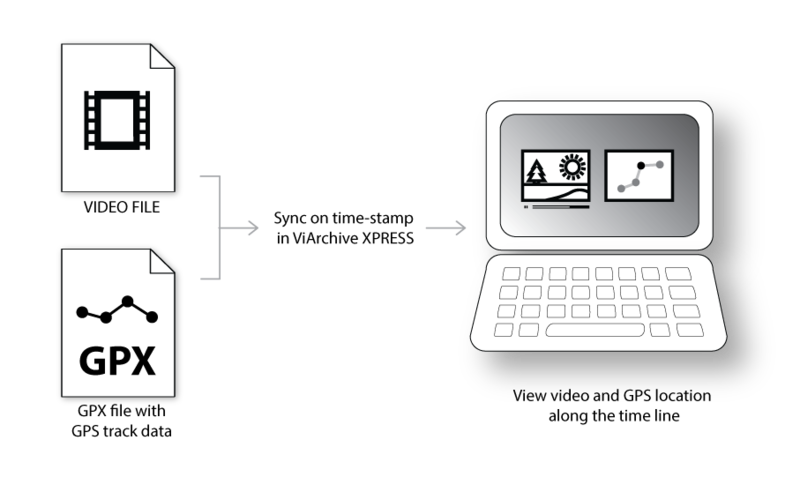 A video file and a GPX file can be paired and synced on their time-stamps in ViArchive XPRESS. The result is that you can watch a video clip and at the same time follow the track along which it was filmed on the map. To jump to a location in the video you can now also click on a section of the track in the map. What if the time stamps of the camera and the GPS track recorder were not synchronized when the recording was made? Discrepancies between the two devices can be corrected in ViArchive XPRESS by an easy to use synchronization interface where you simply define how much off the GPS track is in +/- days/hours/minutes/seconds. The map module comes with access to freely available maps (Bing Maps, Open Street Maps), but can also be connected to various Web Map Tile Services (WMTS) like ArcGIS from Esri. 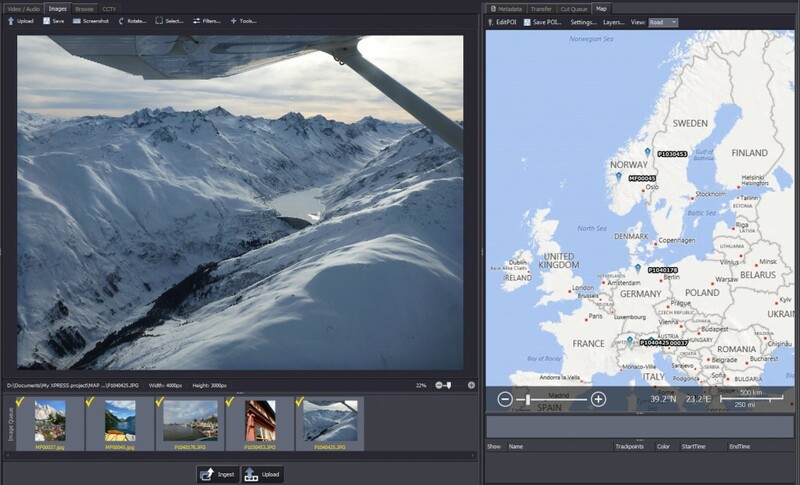 The map module can also be used to view and edit images’ GPS location. This can be done both on singular images and in batch (add the same GPS location to several images at once). For images without existing GPS tag, it is easy to create one and drag it to the correct location on the map – this location can then be saved to the file.